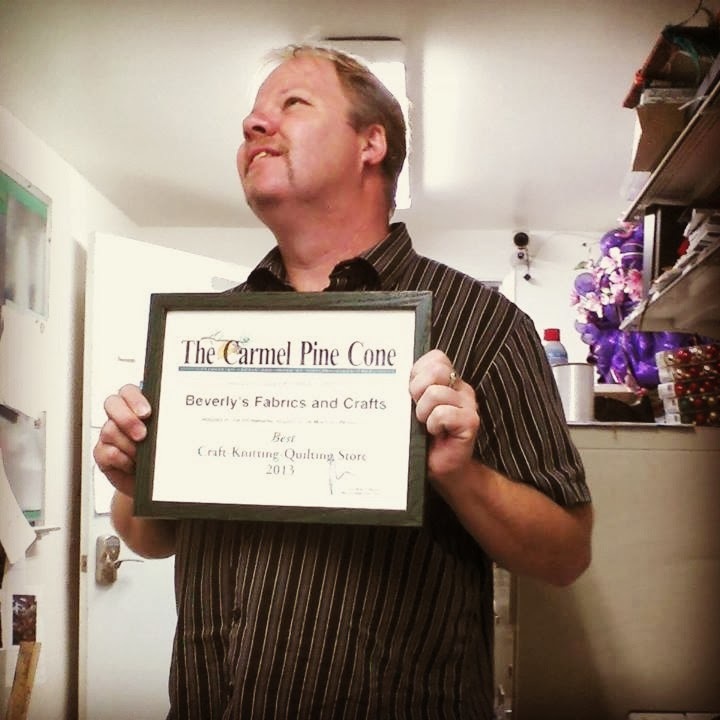 Beverly's Official Blog | News and findings from world of crafts, scrapbooking and more: The Carmel Pine Cone Says...We're the Best! The Carmel Pine Cone Says...We're the Best! Monterey manager Todd displays his certificate with pride! Last month, the Beverly's in Monterey was nominated as the Best Fabric Store in the Monterey Peninsula by the Carmel Pine Cone. We are overjoyed to announce that WE WON! Pictured above is Monterey's hard-working manager Todd. As you can see, he is positively glowing about this exciting news! Everyone here at the Beverlys.com headquarters would like to deliver a heartfelt congratulations to the entire Monterey staff, as well as a HUGE thanks to all of our Monterey/Carmel area customers. Not sure where your local Beverly's retail store is located? Find out with our easy to use store locator tool on our homepage.